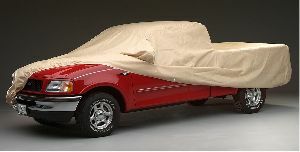 Showing 1 - 10 of 16 Products for Car Cover. Technalon covers (made with Block-It(TM) Evolution(R) fabric) feature 4-layer polypropylene construction for maximum protection in all weather conditions. Often imitated, but never equaled, this U.S. made fabric is used by millions of satisfied car enthusiast around the world. These are naturally moisture resistant and breathable. Provides a dust and pollution barrier with two middle layers of Evolution fabric that act as a filtration layer. Impact absorption with 4-layer thickness absorbs impacts better than any other vehicle cover fabric to help protect the finish from nicks, dings, dents and scratches. Easy to use. 4 year limited warranty. Block-It(TM) 200 Series fabric uses 3-layer polypropylene construction for moisture and dust resistance, and the fabrics are treated for extra UV resistance. Standard covers can be used outdoors on a limited basis against moisture, but because the fabric is breathable, any moisture or condensation can easily evaporate. They make excellent dust covers for indoor storage and the extra UV resistance in the fabric assures good service when used outdoors.